A bench vise is a very useful tool to have at home or in your “workplace” like the tool shed or garage. Usually set up or mounted on “workbenches,” the bench vise is a tool that needs a firm and stable surface for support. This is what’s going to keep it in place. Although bench vises are versatile and can do different kinds of work, it is still essential to find the best bench vise for your project. Today, we will be featuring a simple buying guide and several product reviews to help jumpstart your hunt for the best bench vise. A bench vise is probably o﻿﻿ne of an essent﻿﻿ial tools for any woodworker, metal artisans, blacksmith, and the like. These small yet strong clamps work brilliantly for many industries because it keeps the workpiece stable. For one, imagine sawing a thin piece of metal without something that pins it into place. 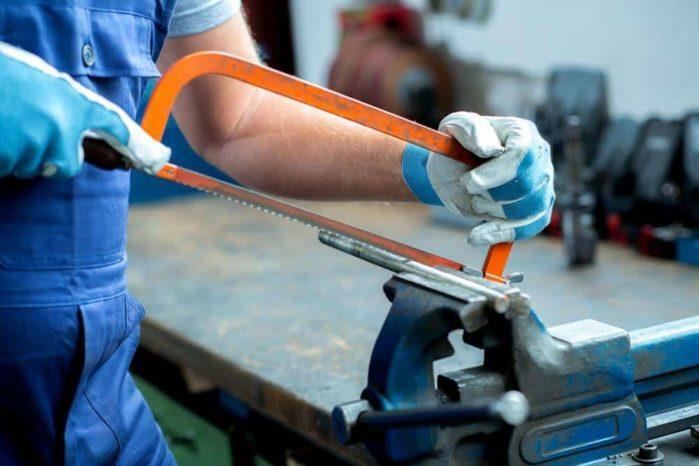 Yes, you can use a clamp, but these clamps are not bolted to an immovable object. Thus, it can still be quite loose. Back when there was no bench vise, people use many inconvenient techniques. One of these techniques involves stepping on the workpiece to saw it. With the bench vise, stability will never be a problem. Since it’s often mounted on a table, all you need to do is open and tighten it to your desired wish. Its powerful jaws will keep things in place, allowing you to do many things. Sanding, sawing, polishing, painting, and hammering are all easily done thanks to the bench vise. It’s important to understand the factors involving a bench vise. Remember, relying on one of these means that you’re going to count on it to protect your workpiece. After all, the primary function of a bench vise is to lock down the project to prevent any inaccuracies. Since we’ve mentioned accuracy already, the first factor that you should look into is its grip. The bench vise has a top jaw and a bottom jaw, one that moves away from the other. It’s almost similar to how our mouth functions. These jaws are probably the most crucial part of the bench vise. This is because all the tension is concentrated on the jaws when locking the project in place. 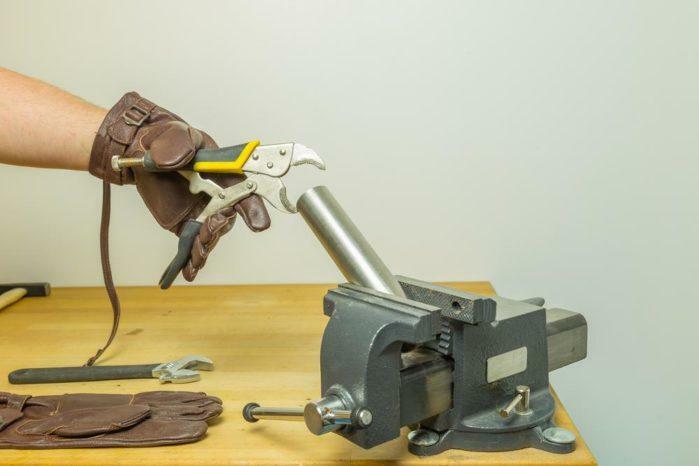 Ideally, you want to test the bench vise first if it has a firm grip or not. However, if you’re buying online, you’ll know it’s a trustworthy tool if the grip is serrated. Some bench vises may have serrated jaws, but the grain is poorly manufactured and done. As a result, it dulls quickly and loses that serrated feature that keeps things secure. So always check how the metal teeth look like. If the serration is deep enough, then that means it has a good grip. Another unique feature of the bench vise is it’s like a vice grip, except it’s mounted to an immovable surface. This is why it’s such an important item because even if you’re planning to hacksaw a pipe of metal, it’ll remain stable. However, take note that there are plenty of instances that a bench vise moves. In my experience, I’ve seen countless of workers saw a piece of wood with a lot of force. Afterward, because of the tension applied, the bench vise would spin and lose its position. This is not only wrong for your project, but it is potentially dangerous given that you might be handling a sharp object. Always check the screws’ tightness before using a bench vise. Better yet, make sure it has a flat and leveled base to avoid unnecessary movement. Another feature to add is the swivel base of the bench vise. Swivel bases help rotate the bench vise, which gives you more flexibility. Usually, you can see its benefits if you’re handling a project with lots of irregularities. These can be tight corners, unsymmetrical shapes, or weird angles. Thus, always check for the swivel base and its capacity to turn. Ideally, you’d want to have a base that can set at 360 degrees, although 120 degrees is good enough. Overall, a strong base coupled with a good swivel action makes the bench vise highly versatile in the long run. A bench vise with a reliable anvil is always a huge bonus. Some workplaces don’t have the luxury to have a large work table along with the bench vise. If your bench vise has a large anvil, then that’s a huge help. Anvils are meant for you to work on your project as you use the bench vise. For example, if you’re hammering a piece of metal, you can do it while it’s clamped in the vise or on the anvil. When checking for the anvil, always check if it’s smooth and flat. An anvil that has a rough surface can potentially damage your project due to friction. Thus, it’s better to know the material of the anvil. Yost Tools offers its utility combination pipe and bench vise in five different sizes: 4.5, 5.5, 6, 6.5 and 8 inches. The 4.5” Bench Vise with a 0.125 to 2 inches pipe capacity features enhanced replaceable top jaws and permanent pipe jaws, both of which are grooved. This makes the handle ergonomic. The swivel base can also be rotated 360 degrees to help you get the proper placement and locks in place. With a cast iron body, steel U-channel bar and a flat portion, it can also serve as an anvil or an additional work surface. The handle comes with rubber washers to keep it from sliding. The 360-degree swivel base comes with two locking screws. This is what keeps it from turning without cranking the locking screws down. Compared to other brands that have none, Yost comes with a preload spring. The rubber washers might be a little loose to keep the handle from sliding because of its weight. You will have to use it with grease or lubrication because it is only lightly oiled. 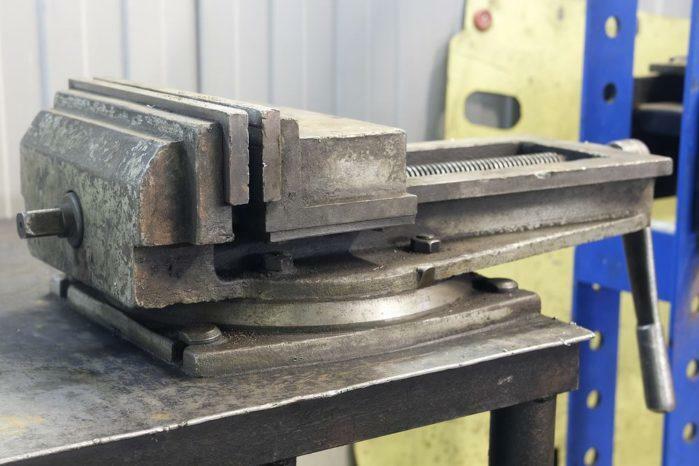 You might find this a bit of a hassle if you expect your bench vise to be oiled beforehand or if you do not have any of the two products mentioned at home. Wilton’s 11106 Bench Vise, on the other hand, has a jaw width of 6 inches and jaw opening of 6 inches as well. Similar to the Yost Utility Combination Piper and Bench Vise, it also features a double lock down swivel base. It is made from high strength steel which ensures its durability. Also, it also has a large anvil work surface and a lifetime warranty so you can get your item replaced, just in case you encounter a manufacturer problem. All you have to do is show your purchase information, and probably a few photos of the product. It comes with a lifetime warranty/guarantee, unlike other brands. Its 100-degree swivel is useful for normal jobs such as sanding or even angle grinding. It has an excellent construction.The screw jack would seem machined instead of cast. It is only ideal for light to medium work. Anything heavier and it might not be at its top performance. It has little to no information or instructions that come along with it. You might have trouble answering questions should you have one, especially if you’re a first time user. Yost Vises makes a second appearance on our list which proves that it’s one of the leading bench vise manufacturers.The second Yost product has a proper 6.5” jaw width with a swivel base. The 6.5” jaw of this vise is specially designed to grip flat surfaces tightly. However, should you need to work on a bigger material, it can be extended from 7 to 11 inches. The swivel, meanwhile, can be adjusted to 360 degrees and locks the bench vise for easy use. It has a ductile iron body that makes it extremely durable and versatile. Two flattened areas of the body can act both as an anvil and as working table. Reversible front jaw helps it expand until 11 inches. The top jaw is also replaceable. It comes with a serrated surface for a stronger grip on your workpiece. On one end, it also comes with a smoother surface that’s designed to accommodate fragile workpieces such as glass sheets. It has a lifetime warranty. The Tekton swivel bench vise comes in a sleek black design with a shiny metal jaw. You can get this item with three variations depending on the width of the jaw. The shortest one starts at 4 inches while the longest reach 8 inches. The prominent feature of the Tekton is its sleek and sturdy body. It’s made from cast-iron that has around 30,000 PSI strength. The steel jaws are serrated. Thus it helps grip the workpiece tightly and prevents it from slipping. Similar to the other great bench vises we’ve talked about, the Tekton has a replaceable jaw. The Grizzly G7057 lives up to its name because it is truly as tough as a grizzly bear. Weighing in at 15 pounds, this bench vise is designed to be a heavy duty bench vise for many applications. It’s strong to clamp down large blocks of metal, and it’s even better for smaller projects. The Grizzly has a large center slide which keeps its powerful jaws intact and in direction. It doesn’t slip, so you have full control over your workpiece. Together with this, it has large Acme screws that keep it stable at all times. Like any other work equipment, each brand has their own set of pros and cons. You just have to carefully weigh both the benefits and disadvantages and see if you will be getting what you want/need from the bench vise. Should you want a versatile, medium sized bench vise for projects that are not too heavy, Yost might be a good option to start with. It is very durable, and it comes with a lot of other key features not present in other brands. Features such as its locking screws and 360-degree swivel base are safe and efficient additions to the tool that can come in very handy. If you found this article informative, let us know below and share your thoughts! Good luck and don’t forget to share this with your friends!